The incident happened just ten days ago at the Holy Monastery of Docheiariou in Mount Athos, and it was told to me yesterday evening by a Hieromonk who was present as a witness of this miraculous event, although he mentioned it publicly last week at a religious event in Thessaloniki. Inside her home, at the Holy Monastery of Docheiariou in Mount Athos, where daily the revered Abbot Elder Gregory with the brotherhood of the monastery chant the Supplication Canon to her grace and commemorate hundreds of names on behalf of the health of the living and the repose of the dead, another one of our fellow men was praying in her chapel where he received in actuality the grace of the Panagia Gorgoepikoos, who quickly and obediently listens and has mercy on all who reverently call upon her with faith. 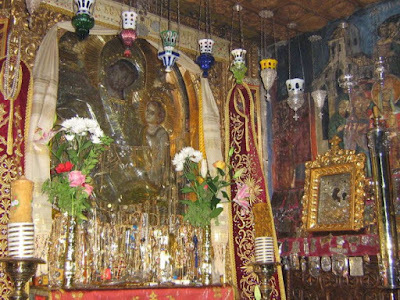 According to this witness, a young man from Skopje, who is 18 years old from the city of Stromnitsa in the neighboring country, who had problems speaking, went to the Holy Monastery of Docheiariou to venerate the miraculous icon of Panagia Gorgoepikoos. He had come with a relative from Thessaloniki who was speaking about this monastery and icon to his family. When they arrived at the monastery and stood before the icon, although the young man had never spoken in his life, he started crying out with inarticulate words in his native language: "Mother All-Holy, grant me my health!" At that moment everyone who knew the case of the young man was surprised by the incident. By the end of the prayers which the undisturbed Hieromonk continued reading, the young man from Skopje turned to all those who were present there praying with him and said: "I thank all of you; already I feel very well." This is yet another display of the miraculous power of the Panagia Gorgoepikoos of the many which take place on a daily basis to the faithful of Greece and beyond, who daily chant her supplications: "To the ends of all things, your wonderworking icon is spoken of, by all from their lips, carrying the Gorgoepikoos."